The Columbia River 1091K My Tighe is a tough folding knife designed by knife maker Brian Tighe. It features an innovative blade design with a hybrid edge, combining a plain section towards the tip with patented Veff Serrations at the base. These large, scalloped serrations slice fibrous materials without snagging. Its re-curved shape gives it a sharp point and a long cutting belly, and it is hollow ground for razor sharpness. The black titanium nitride coating enhances wear resistance and prevents reflections that might give away your position. 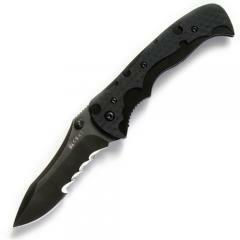 It opens using a pair of ambidextrous thumb studs, and features the OutBurst assisted opening mechanism, a spring system that takes over once the blade passes 30 degrees for extremely rapid deployment. Its bronze and Teflon bearings keep the action smooth and fast. The handle is an open-build design, with heavy-duty stainless steel frame locks for security. The Zytel scales are coated with black EDP and shaped and textured for a secure grip, and the optional Teflon-coated pocket clip makes it easy to carry.